Badalona (Spain) (AFP) – The Spanish group whose migrant rescue boat has been impounded by the Italian authorities hit out Thursday at what it called a deliberate campaign to ensure there were no independent witnesses to how refugees are treated while trying to flee from Libya to Italy. 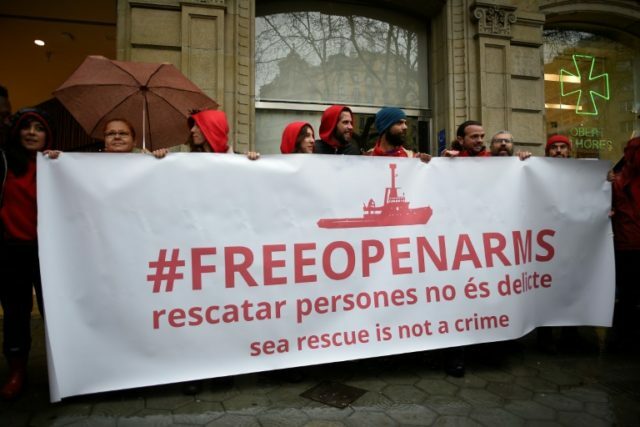 “Proactiva Open Arms is the new target of a clear institutional, political and media campaign that wants to keep away witnesses who could denounce human rights violations in the Mediterranean,” founder Oscar Camps told a news conference. The Proactiva Open Arms group, which has saved more than 5,000 migrants since the start of 2017, had its boat impounded at the port of Pozzallo in Sicily, where it arrived on Saturday with more than 200 people rescued off the coast of Libya. The non governmental group had refused to hand the migrants over to the Libyan coastguard, despite warnings from Rome and what the NGO claimed were death threats from the Libyans. The prosecutor’s office in Catania in eastern Sicily has opened an investigation into the NGO and three of its leaders for criminal conspiracy to promote illegal immigration. The NGO’s legal adviser, Jaime Rodrigo, an expert in marine law, said the legal justification for impounding the boat was “non-existant”. “It is possible that the boat will be held for a very long time, because the seizure can last as long as the procedure, and we know how long the procedures are,” he said. The boat is currently the NGO’s only craft in operation and its seizure means Proactiva Open Arms, which is facing financial difficulties, cannot carry out any more rescue operations. “We are flies and they’re using cannons to fire at us,” Camps said, calling for private donations and support from institutions. Italy is the main entry point for migrants arriving in Europe across the Mediterranean. According to the International Organization for Migration (IOM), as of March 25, more than 6,100 migrants had reached Italian shores since the beginning of the year and 359 have died. In 2017, the number of arrivals in Italy was close to 22,000, with 727 deaths.